Softros LAN Messenger allows you to automatically deploy a custom user group list across the network. To do so, you need to configure the list on one of your computers, export it, and then import it to other machines. The group settings file can be stored and imported from a server. When the file is updated on the server, all copies of Softros LAN Messenger import the newer version upon next login. User group deployment is impossible before installing Softros LAN Messenger on all computers and populating the user list on each of them. After adding required groups and moving all users to them on one of your computers, follow these steps on it. On the General tab in the Settings dialog box, click the Groups Settings link. 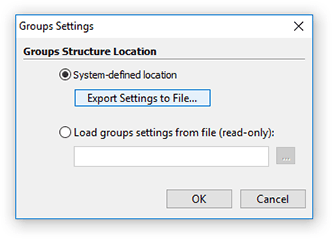 In the Groups Settings dialog box, click System-defined location, and then click Export Settings to File. In the dialog box which appears, select a folder to store the group settings file, enter a name in the File name text box, and then click Save. The file will be saved in .data format. When the export is finished, click OK. The settings are successfully exported. To load the exported group list on other computers, follow these steps on them. 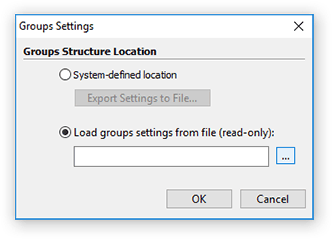 In the Groups Settings dialog box, click Load groups settings from file, and then click the button to the right to select the file. In the dialog box which appears, select the folder where the exported .data file is located, click the file, and then click Open. In the Groups Settings dialog box, click OK. When the import is finished, click OK. The settings are successfully imported.